THE SCENES: Living as a hermit, Obi-Wan Kenobi watches over a young Luke Skywalker as he grows up on Tatooine. WHY THEY’RE AWESOME: Lately I’ve been obsessed with the version of Obi-Wan Kenobi that Mike Mayhew drew for Marvel’s Star Wars title. Specifically, issues #15 and #20, which hit the stands in 2016. What I find so interesting about Mayhew’s version of Kenobi is that he didn’t take the obvious route, and draw him to look like Ewan McGregor. But he didn’t go the Alec Guiness route either. Mayhew opted for something more his own. A figure that captures the essence of the character, without being beholden to either one of the actors. That approach isn’t so far-fetched in the world of licensed comic books. Often it’s met with an eye-roll from yours truly. This, on the other hand? This works. Something about it screams classic Star Wars. As if it’s transplanted from an era before the prequels, where we were still imagining what a young Obi-Wan Kenobi might look like. It achieves a warm and fuzzy nostalgic quality without feeling like it’s trying too hard for it. Though Jason Aaron has been off Star Wars for awhile now, I’d love to see them revive this journal framework. If they can bring Mike Mayhew back for it, all the better! 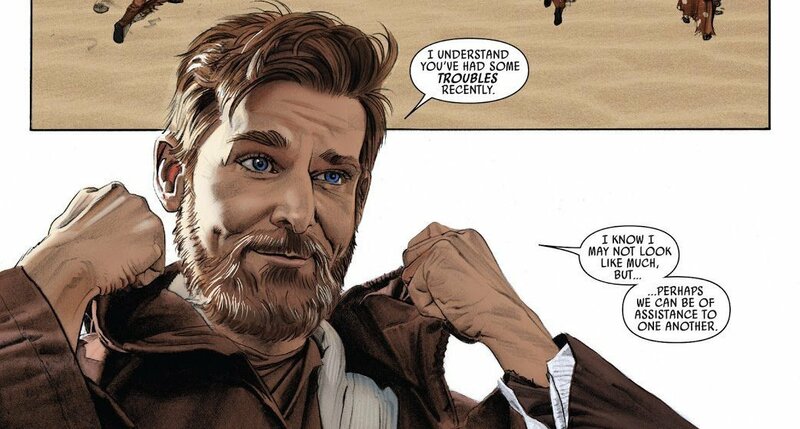 This entry was posted in Comic Books/Graphic Novels, Panels of Awesomeness and tagged Ben Kenobi, comic art, comic book art, comic book reviews, comic books, Ewan McGregor, Jason Aaron, Marvel, Marvel Comics, Mike Mayhew, Obi-Wan Kenobi, Panels of Awesomeness, Rob Siebert, Star Wars, Star Wars #15 (2016), Star Wars #20 (2016), Star Wars (Marvel Series), Star Wars comics, Tatooine on 12/02/2018 by primaryignition. A Christopher Robin Review – What Would Pooh Do? I really love Winnie the Pooh. Christopher Robin was essentially marketed as a movie where Pooh and his friends put the title character, a cynical and withdrawn adult who neglects his family in favor of work, back in touch with his inner child. Something you can take your kids to see, while also taking something home for yourself. And that’s what it turns out to be. It’s a very nice movie. It’s true to the characters, Jim Cummings hits all the right notes as the voice of Pooh (and Tigger), and Ewan McGregor is a fine choice for an adult Christopher Robin. All that said, Christopher Robin underachieves. Or at least it feels like it does. As we were leaving the theater, Mrs. Primary Ignition and I realized what we’d been expecting, based on the trailers and advertising: Toy Story 3. Or perhaps Toy Story 3 in reverse. If you were an adult when Toy Story 3 came out, I’ll bet what you remember most about it is the ending. Andy has to leave his childhood, i.e. Woody and the gang, behind as he goes off to college. In Christopher Robin, our main character has long since left his childhood behind. But now his old toys have popped back up to remind him of who he used to be, and what’s really important in life. Whether Disney meant for this or not, the trailers for Christopher Robin very much evoke that sentimental tearjerker vibe we got from Toy Story 3. But it doesn’t deliver on that. So it ends up being just another movie. Which is a real shame. I’m not suggesting Christopher Robin should have been a more mature movie. It doesn’t need to be. But I think it could have benefited from Ewan McGregor being a little more Scrooge-ish. The movie depicts him as someone who’s lost touch with his own heart because the world has ground him down so much. Let’s see a little more of that. He didn’t need to yell or scream. We just needed him to be a little more…cold. Then it’s that much more impactful to see his heart warm in the end. This entry was posted in Movies and tagged Christopher Robin, Christopher Robin (2018 Film), Disney, Ewan McGregor, Jim Cummings, Mrs. Primary Ignition, Pooh, Rob Siebert, Walt Disney Pictures, Winnie the Pooh on 08/05/2018 by primaryignition.